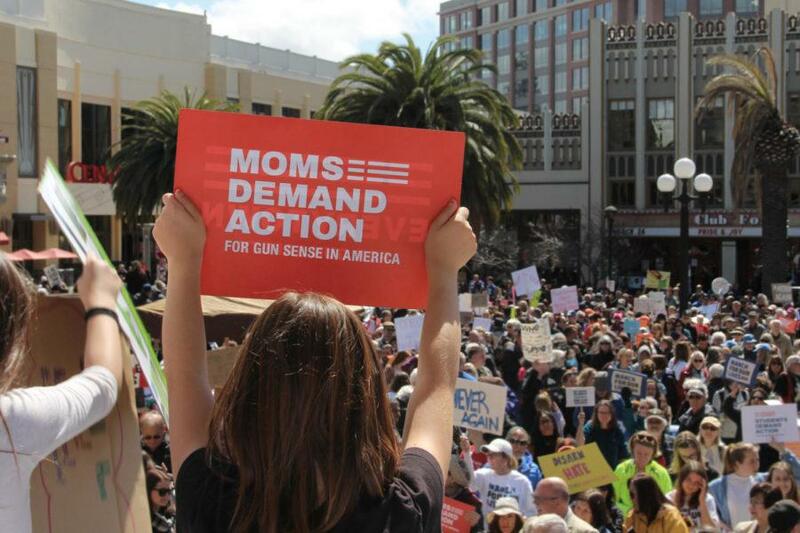 At 837 marches, communities gathered to protest the lives lost to gun violence. But in Redwood City, it was different. In Redwood City, the rally was for the students, by the students. At the head of the cause was a group of students from the Sequoia Union High School District: Stefan Sujansky, Holly Newman, Sophie Penn, Ria Calcagno, Elise Kratzer, and Katie Uthman. 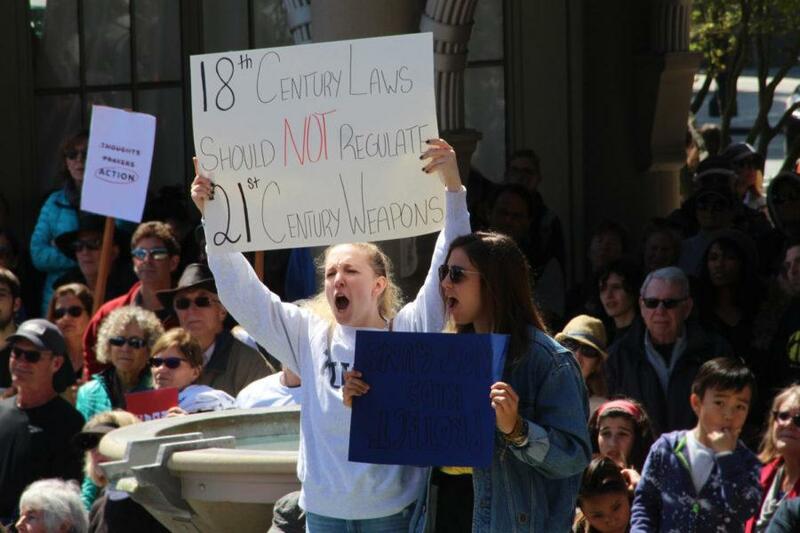 While another rally was already scheduled to take place in San Francisco on March 24, Penn, a senior at Carlmont High School, said bringing the issue to Redwood City would make it more accessible for the community. 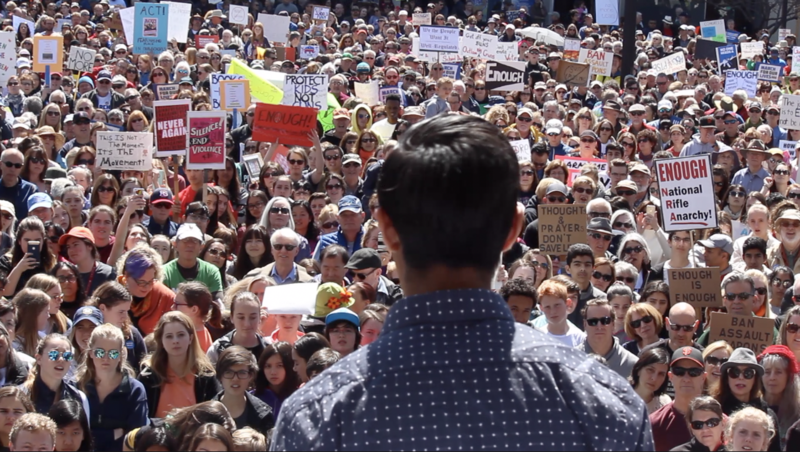 But when they began planning less than a month ago, they didn’t expect the thousands of children, parents, and teachers to pack Redwood City’s Courthouse Square. Among the thousands was speaker Francesca Battista, a sophomore at Menlo-Atherton High School. 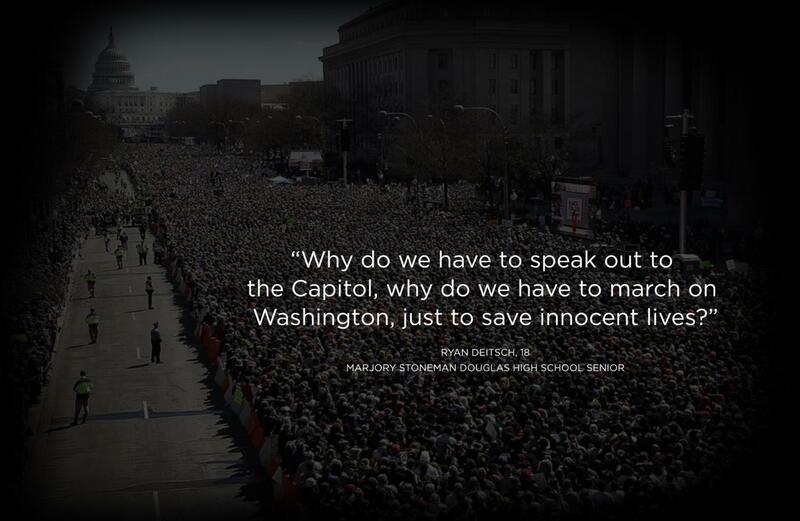 She felt that Parkland set off the March For Our Lives movement because of a shift in mentality. For Battista, it is important to express her voice now that she is in high school and understands gun violence better. But times have changed, and now, even third-graders, like Arundel Elementary School’s Hayden Vandenberg, understand and want to make a change. 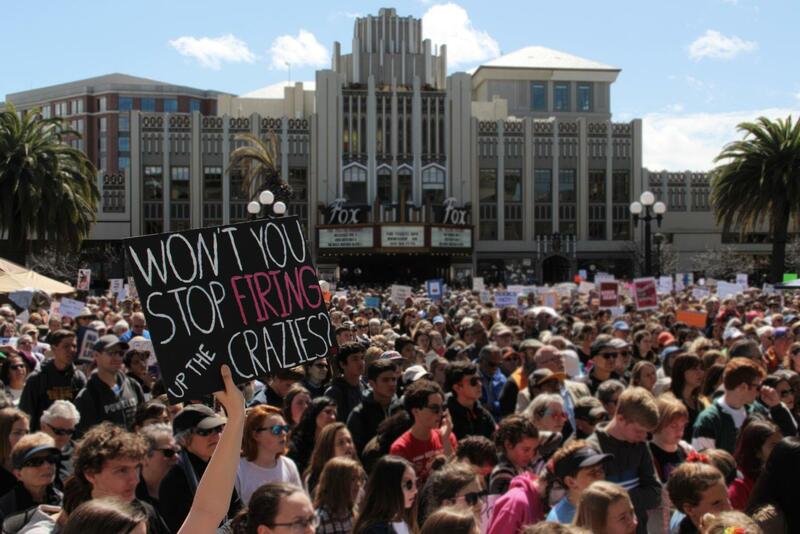 And that’s what Redwood City’s rally was all about – it wasn’t the adults who drove the cause, it was the students. 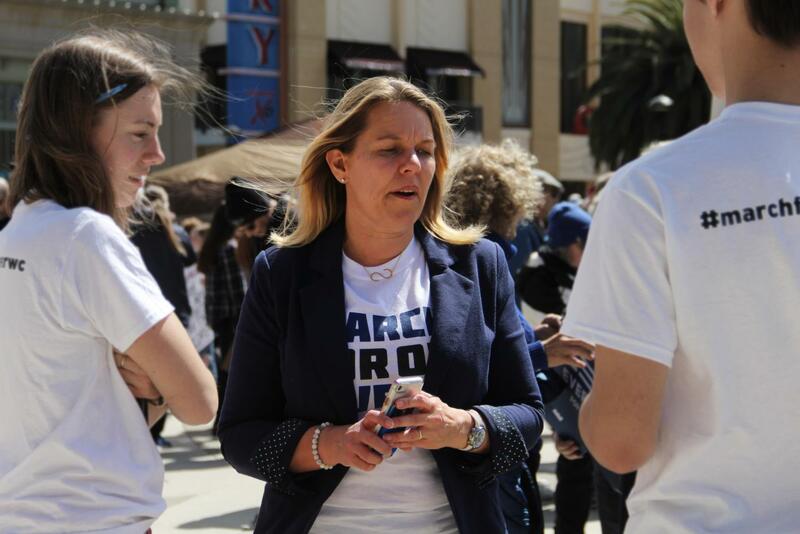 Redwood City councilmember Shelly Masur said what made the rally “amazing” was the student involvement. The involvement of students like Sujansky, a senior at Woodside High School, contributed to the success of the event. Because students organized and ran this event, young people, like Emma T Capps, 21, felt empowered to share their opinions. Capps, a cancer survivor, said in her speech that she is more afraid of dying from gun violence than dying from cancer because cancer can be treated. Capps, along with the other student activists who spoke out, believe they have taken a step in the right direction for their safety at school. Jordan believes that gun control should no longer be a political argument, and that despite one’s political beliefs, students should not be dying at the hands of guns. She wanted to speak because she spent the last two weeks, along with her fellow students, producing a special edition newspaper for Carlmont, solely about gun control. After writing an editorial, as a response to the lack of change in our country, she wanted to express her anger and share her thoughts on the subject. She believes that if the government will not make change, it is the responsibility of the people to enact change. There have been too many shootings with too little action. She was motivated to speak after experiencing the school security policies in another state following the Parkland shooting. She hopes that there will be policies put in place in the future that allow children to go to school without fear. Emma hopes that this movement will not die down until real change is made. Bianca is fighting for stricter gun control (no access to military level weapons such as fully or semi automatic guns). The Florida shooting motivated her to speak because it was the first time she realized: I could be next. She has watched many videos and read many reports and even tried to get in contact with some of the families of the victims. The scariest thing was that the first victim she researched (Aliza Alhadeff) has her same birthday: May 1, 2003. She is not speaking primarily out of frustration or anger. She is mostly speaking out of fear. Fear for her life. She is scared that one day she’ll go to school and won’t come back. Stefan is a senior at Woodside High School who is passionate about creating change in his community. 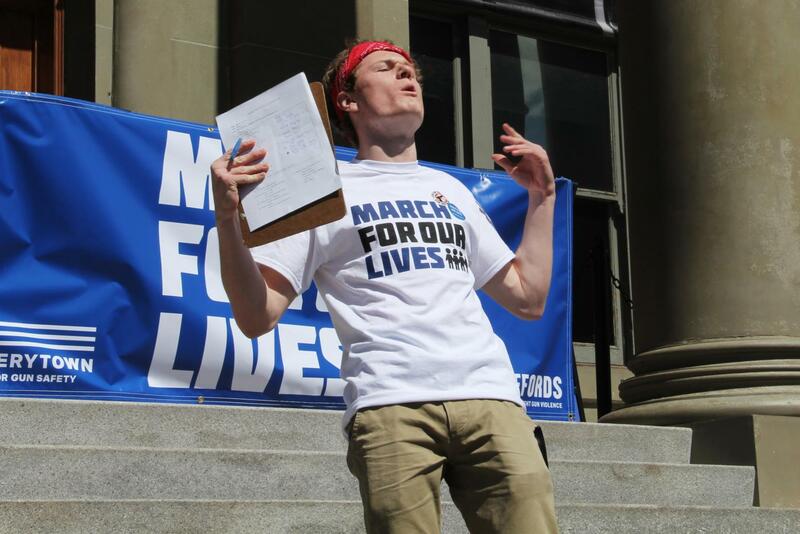 He was one of the four key high school students that helped to plan and run the March For Our Lives RWC, which ultimately was a huge success. Stefan was very excited that so many people of all generations came out to support the causes he is passionate about and was especially proud to see the younger generation’s presence at the march. He is proud of the work that he and his fellow students have done and the impact that they have made on their local communities, including empowering younger people to take a stand. Caden is an avid supporter of gun control. She believes in protecting all people’s rights so she respects those who don’t believe in banning guns, but she does believe in gun control. She thinks lives should be protected before guns, and that’s why this movement is so important and moving for her. She super passionate about a lot of subjects and recently performed a poem that was received really well. 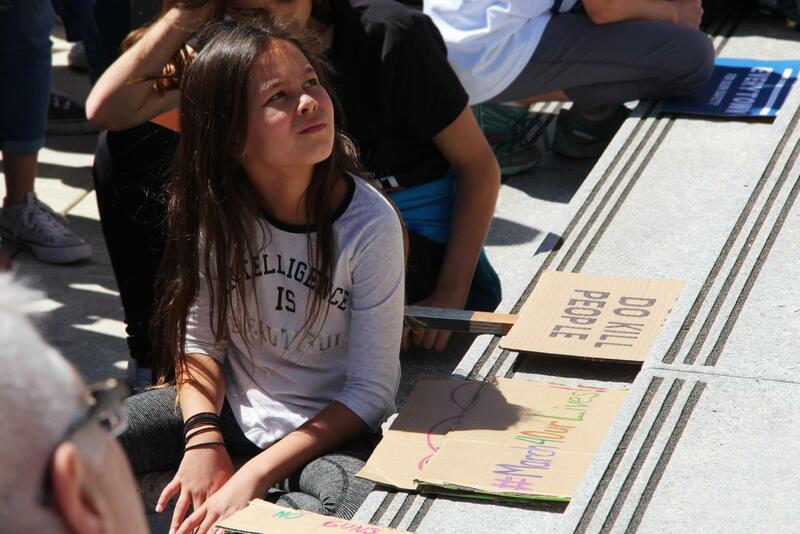 After attending the walkout at El Camino Park, she thought this would be an amazing opportunity! Caden decided to put herself out there and step outside her comfort zone because this is super important to her and she wants to make sure her voice is heard. She has a lot of goals for the future regarding making change and helping others, but right now, gun control and March For Our Lives is at the forefront of that. Avani believes that gun violence is not acceptable. People should not be losing their lives and peers because of something that could have been prevented. She was excited to speak at this event because she thinks that it is important to speak up for what you believe in. She wants to make her voice heard, inspire others to speak up, and be inspired by all the other speakers and people that attend the event. 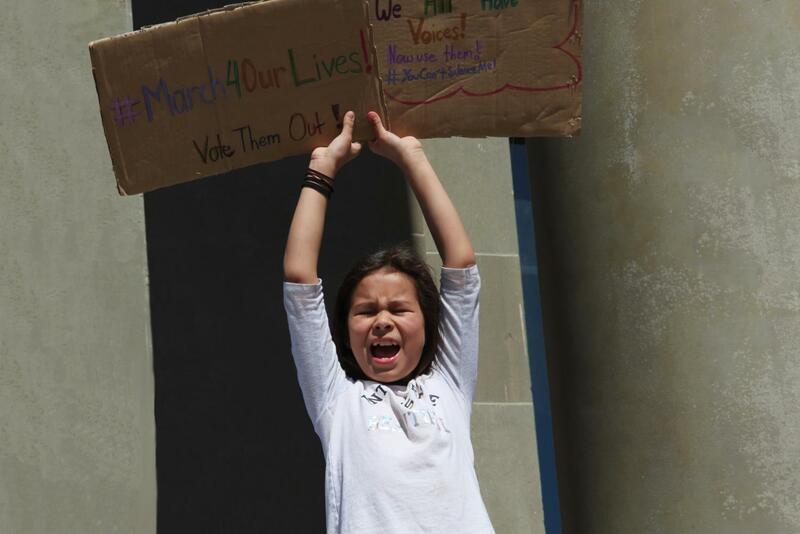 Avani hopes that through March For Our Lives, the government hears what we have to say and that gun laws are reformed, shootings are prevented, and that people get inspired to make their voices heard. As a part of the generation born after Columbine, the looming threat of mass shootings has become a norm, lockdown drills are routine, and the news coverage of the latest tragedy unsurprising. Sick of the American adult apathy, Francesca has worked with her peers and taken to the streets to demand change. Now more than ever, is it integral for youth to speak up. 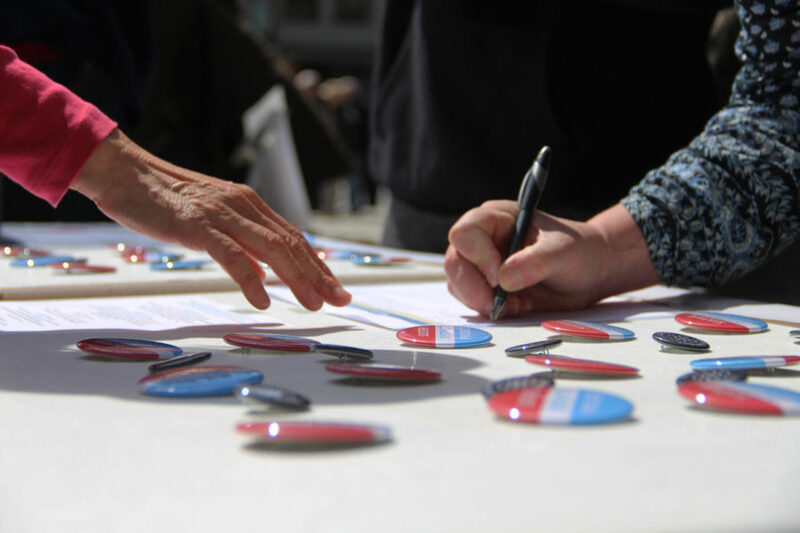 With midterms approaching, and a presidential election that will be open in two years to those now 16-18, we are reminded of the gift of the right to vote – one which is not granted and one which we must keep alive through our participation. Francesca is continually amazed by the tenacity and passion of her peers. Mira chose to participate in the rally, because it is completely run and led by students who know that in order to make real changes and implement true gun control legislation. We must unite and take action. In addition, this event gives a voice to youth who would likely be unheard if there was no place for them to take a stand and voice their opinions. She hopes that this is only the beginning, and that these empowered students continue to take a stand for what is right to pursue a brighter future. Advait has never needed a gun or felt unsafe in his community. The fact that people are dying from gun violence and the fact nothing is being done about it makes her feel frustrated at our institutions. America is supposed to be the best country in the world, yet we can’t even keep our citizens safe. Everyone has great ideas about improving our country, but our government does nothing. Advait wants to bring change-makers of all political stripes together to bring back the voices of everyday citizens to our national conversation. She has a lot of different perspectives on this topic. As a student, the problem of gun violence, specifically school shootings, affects her personally. That’s why she wanted to speak about. Students have the most important voice in this problem. The fact that school shootings have become so common is frightening, but what’s more shocking is America’s numbness to tragedy. She believes we as a society need to combat this major problem. Her major motivation to speak is to advocate for not only her beliefs, but to contribute in a positive way to our ever changing nation. Ever since she was little, Lily has tried to be a leader and speak to crowds whenever she could. Make her voice heard. Recently, she’s been able to fulfill that part of her that wants to contribute to our world. She was able to speak at the student walkout and, now, the Redwood City protest. Lily has never felt so empowered. Holly’s speech was an overview of the nationwide student movement and the various ways we’ve gotten involved around here; She organized the walkout on the 14th with a few other MA students as well as M-A Unity Week to promote on-campus activism and involvement. 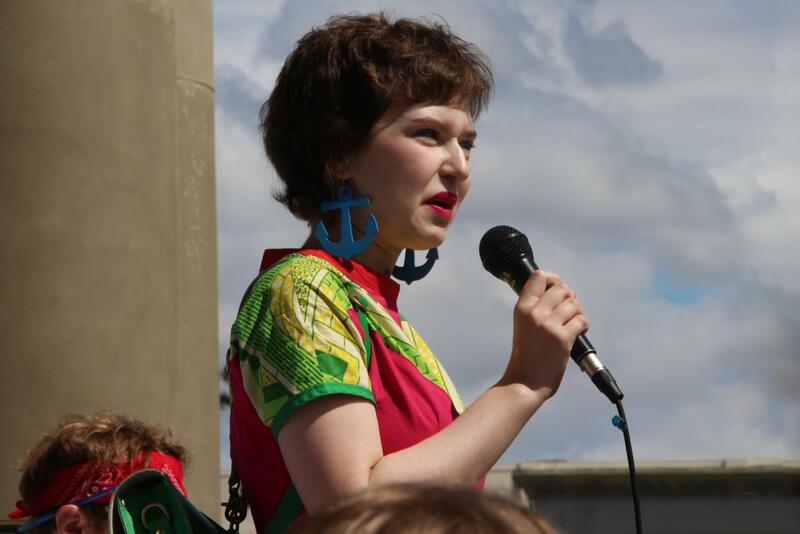 All the organizers of the rally on the 24th are really proud to be able to create this platform for students to speak their minds — that’s really why she’s doing it: to foster youth involvement and interest in politics. We are the next voting generation and need to make our voices heard as loudly and clearly as possible. She is passionate about politics, having worked on Hillary’s campaign as an Organizing Fellow for San Mateo County as well as serving as a Senate Page in DC last year. 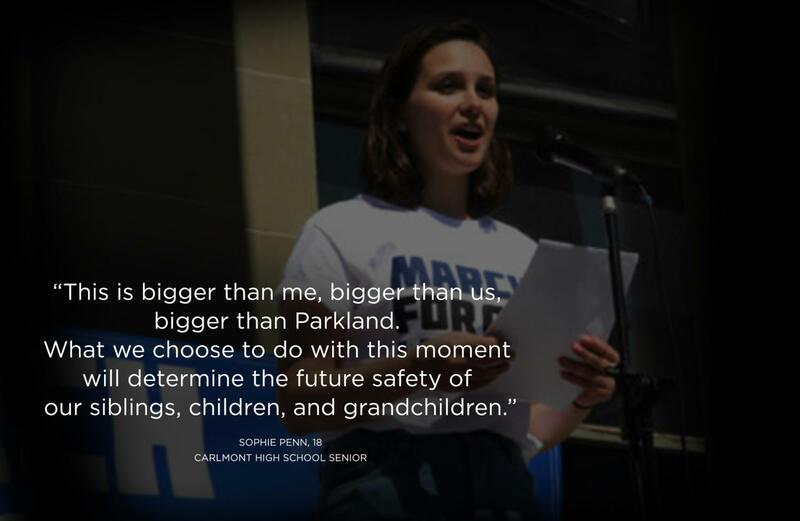 Sophie is currently a senior at Carlmont High School who has always been greatly involved in her community. She is an Editor-in-Chief at her high school’s journalism program which has given her immense opportunities to speak her mind and broaden her perspectives. She was one of the four key high schoolers who helped to plan and run the March For Our Lives RWC that ultimately turned into a huge success (which she was very excited about). 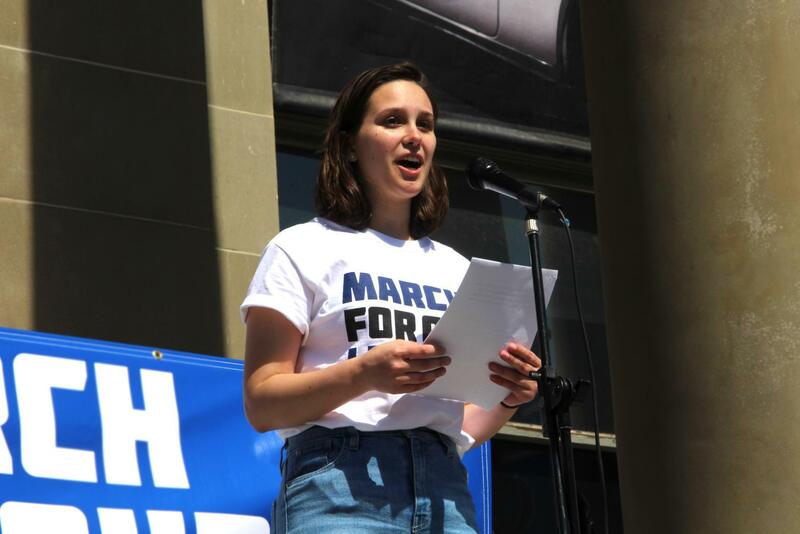 She was determined to bring the march to her local community as she has been passionate about gun reform throughout the past few years since mass shootings have been on the rise. She hopes that others are also educated on the topic and that she has made an impact on the community. 2016. Sutherland Springs. 26 lives. 2017. Las Vegas. 58 lives.